Are you experiencing hair loss, thinning or a receding hairline? Hair loss and thinning can be tough on a guy’s confidence and style, and unfortunately, most men will experience some form of it by the age of 30. This is natural and common, but can be prevented or even reversed with the right regrowth products. If you’re looking for hair loss remedies such as hair growth products for men, then you may be interested in the treatment reviews below. While many hair experts try to push “revitalizing” shampoos and laser light therapy, these options really only help you from losing more hair. And we know you don’t want to just stop the damage, but grow your hair back. The problem is most hair loss treatments reviewed online simply don’t work. Don’t waste your money with these scalp revitalizers and hair strengtheners. The truth is that male pattern baldness, bad hairlines, and lost hair are primarily caused by genetics, so no amount of leave-in conditioner is going to stimulate hair growth. Below, we will review the best hair growth products and hair loss treatments for men. There are only a few real solutions that are proven to work without getting a hair transplant. From Rogaine to generic Minoxidil to Propecia (Finasteride), here are the most effective ways to regrow your hair and stop balding! As the most popular product on the market, Rogaine is the gold standard of regrowth treatments. With almost 9 out of 10 men noticing results in clinical testing, Rogaine is the top brand recommended by dermatologists. The primary ingredient is Minoxidil, which is an FDA-approved medication for male hair loss. As one of the only two drugs approved by the FDA for hair growth, Rogaine works by extending the growth phase and stimulating hair follicles to grow again. It comes in two forms – a foam and topical cream solution – and the instructions are easy to follow. Simply apply Rogaine directly to your scalp, twice a day. If you want a proven product that’s almost guaranteed to grow hair and doesn’t require a doctor’s appointment, you should try Rogaine! As the other FDA-approved hair growth solution, Propecia and Proscar are the brand names of a prescription drug called finasteride. Finasteride stops and reverses balding in men. It works by blocking production of a male hormone known as androgen dihydrotestosterone (DHT). DHT shrinks hair follicles, thereby producing thinner hair, until ultimately stopping hair production altogether. Studies show that Propecia can prevent male pattern baldness and stimulate new hair growth in 90% of men. To try Propecia, you will need to see your doctor or a dermatologist for a prescription. It’s typically not covered by insurance, and costs about $50 to $75 per month. We don’t recommend buying it from an online pharmacy to save money since there are plenty of fake websites that scam people. The medication comes in pill form and will require you to take one everyday. Hair regrowth can occur as early as three months, but results may take up to a year to notice. 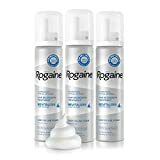 A generic Minoxidil product can offer the same results as Rogaine, but at a lower price. So why buy Rogaine if Costco’s private label brand, Kirkland, is offering the same active ingredient cheaper? With the same 5% Minoxidil formula, this extra strength hair growth product works by dilating blood vessels and allowing more oxygen, nutrients and blood flow to hair follicles. While Minoxidil does not stop the creation of DHT, results show that men will grow hair anywhere they apply the topical solution. Similarly, most guys report seeing regrowth as early as 2 months after applying the medication. Like Rogaine, you can buy Minoxidil in two forms – liquid and foam – and you can choose to use it once or twice a day. But unlike Propecia or Proscar, Minoxidil is an over-the-counter product so you can easily purchase it via Amazon. These treatments continue to be the safest and cheapest way to stop hair loss. If lifestyle changes don’t make a difference, then consider trying these top hair growth products for men!